Oh. Oh wow! I forgot all about this show, but it all came rushing back at the first notes of the opening music. This is a holiday-themed short based on the Paddington books. 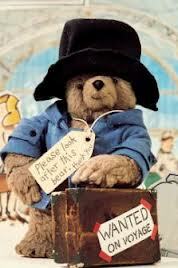 I love Paddington, and I especially love this Paddington. There’s a dry British wit at play here, as well as copious amounts of charm. The animation is the real star, though. Paddington himself is a three dimensional stop-motion bear, and some of the things he interacts with are three dimensional, but all the people and the backgrounds are two-dimensional cut outs. The use of color is very deliberate, and all the voices are done by the same narrator. In all, it’s very evocative of reading a picture book. The story of this particular short is just a straightforward account of Paddington’s experience with Christmas, with little jokes about his gifts and special note of all the tasty food. It’s sweet, and amusing, and well worth tracking down just for the unique style.